Alliance House is a magnificent Grade II listed building in North London, formally home to the China Inland Mission. The building has been fully restored and opened in October 2004 with additional innovatively designed accommodation. You can pay your rent in 1 or 3 instalments. All students are required to pay a booking fee to accept a place in our accommodation. The booking fee includes a £400.00 advanced rent prepayment. The advanced rent prepayment is refundable if you cancel your acceptance of our offer within the cancellation period. Once you have moved in, the advanced rent prepayment is credited towards the first instalment of your accommodation fee. In addition to the booking fee, you must pay the first instalment of your accommodation fee by the date specified on your licence agreement. Once your offer has been accepted, you can pay your accommodation fees at any time by logging into your account on our website. The accommodation fees are split into three instalments from the start of the academic year, with the number of instalments reducing for students who move in later on during the year. Subsequent accommodation fee instalments are normally due around the start of the academic terms. Standard rooms are brilliant value and are fully furnished with a single bed and shared bathroom facilities. A spacious flat with an open plan kitchen and living area, separate double bedroom and bathroom with a shower, offering you a little extra privacy. Perfectly located in the heart of the of the city! Super-speedy broadband in your bedroom means you're always connected. Take some time outside and enjoy our garden area. 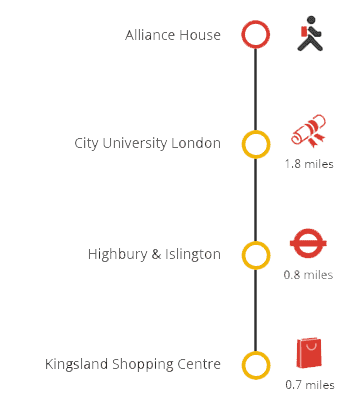 Alliance House, exclusively for City University students is located on Newington Green, within easy reach of Islington and Hackney centres. There are a great variety of local shops, cafes, pubs and bars right on your doorstep. The area hosts many enjoyable community events such as the annual Jazz on the Green. Newington Green also has excellent transport links, with regular bus services to central London and the West End. The listed building has four self-contained, fully furnished one bedroom flats, great for students looking for more independent living. There are also a range of two and three bedroom apartments available. All apartments are fully furnished and complete with bathroom, kitchen, dining and lounge areas- perfect for catching up with your flat mates. In the modern extension, single en-suite rooms are available in flats for five to eight people. Flats are fully furnished with a shared kitchen and dining area. Staying in Alliance House, you'll benefit from great features including free contents insurance, all inclusive bills and broadband - helping your budget go further in the capital. We also provide 24 hour maintenance support, bike storage and an on-site laundry, with a spacious common room and peaceful green space between the buildings. If you're looking for comfortable student living in a stylish area of London, Alliance House is the place for you. Alliance House is on Newington Green, which has a variety of local shops, cafes and bars and a pleasant community atmosphere. Popular pubs include The Nobody Inn specialising in Thai, which holds regular quiz nights and The Almer & The Cellars Pub which serves rustic traditional food. There are regular bus services to central London and the West End, for easy access to the rest of the city. Newington Green has grown in popularity with the local multi-cultural community. In 2006, Newington Green won its first Green Flag Award, the national standard for parks and green spaces in England and Wales. Newington Green has now become a conservation area. On the west side of the Green (numbers 52-55) is London's oldest surviving brick terrace, which is Grade I listed. Sanctuary Students own and manage Alliance House for City University students. Applications for accommodation are received and processed by the City University Student Centre. To apply for a place in Alliance House you need to complete the City University online application. If you wish to live in two-bedroom or three-bedroom flats please select the single with shared bathroom option when accepting your offer then contact Alliance House to arrange for you to share with your chosen friends. Each person will need to contact the hall stating their names and the name/names of those they wish to share with. The University decides who is eligible for an offer of accommodation at Alliance House. We receive their first nominations in May and send offers at that time. You will then need to accept the offer. Broadband services are provided by Keycom - one of the UK's leading providers of Internet services for student accommodation. KeySurf - Broadband at speeds up to 12Mb symmetric. You will also have the option to upgrade to a 20Mb or 50Mb service. KeyView - IPTV, delivering a range of TV channels direct to your PC or laptop. You can collect your keys from the day your contract starts. On arrival, you will be directed to the residence reception desk for check in. Your first instalment payment is due 3 weeks prior to arrival. If you haven't already paid your first instalment the reception desk will require you to make payment. To avoid queues and delays on move-in day, you can pay your first instalment online at any time prior to arrival at the residence. Once check-in is completed you will be given the keys to your room. An area to park and unload your belongings will be available. Due to limited parking space you will be asked to move any vehicle as soon as you have unloaded. The following is for guidance only, please read your Licence/Tenancy Agreement for your full contractual obligations. You can cancel at any time during this period. If you cancel with 45 days, you will receive a full refund of your £400.00 advanced rent prepayment. During the last 45 days before the start of your tenancy – you will only be able to cancel this agreement if a suitable and eligible replacement tenant is found and you have informed our Accommodation Office by calling 0300 123 5050 or emailing london.students@sanctuary-students.com. All replacements must be approved by your university and agreed with us. Students applying to live at Alliance House must contact their university to find a suitable replacement. Students can find a suitable replacement themselves or we or your university can find a replacement on your behalf. However we will only accept the replacement once all our other rooms are full. If you wish to cancel this agreement, you should let us know as soon as possible by emailing london.students@sanctuary-students.com. Refunds are normally processed within 14 working days. Please see our Sample License Agreement (PDF 152KB) for more details on refunds and how to end your license once you have moved in. 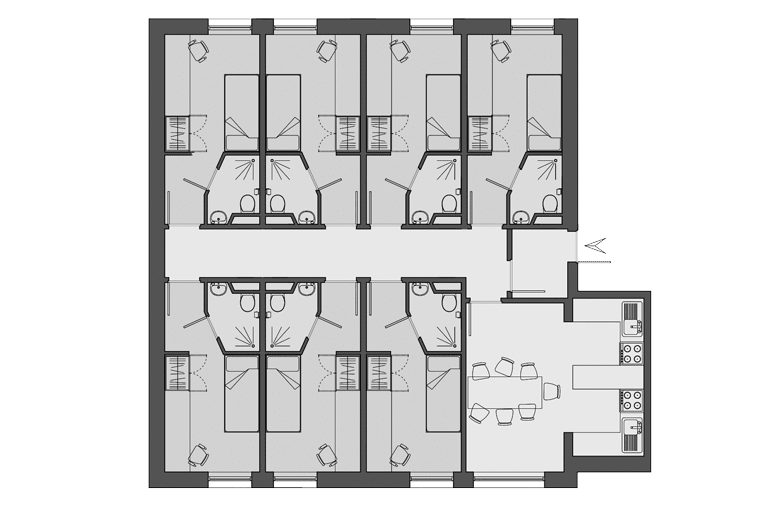 View the floor plans of Alliance House to see an example layout of our flats. The Sample License to Occupy (PDF 152KB) is available to download with details of the terms and conditions of your contract with us. If you wish to bring a car to London you will need to apply for a residents' parking permit through Islington Council and park on the street around Newington Green.